This article is about the Jim Henson film. For the 1991 Jaromil Jireš film, see Labyrinth (1991 film). For the 2002 Yugoslav film, see Labyrinth (2002 film). For the multi-screen film at the Expo 67 Labyrinth pavilion, see In the Labyrinth (film). Labyrinth is a 1986 musical fantasy film directed by Jim Henson, executive-produced by George Lucas, and based upon conceptual designs by Brian Froud. The film revolves around 15-year-old Sarah's (Jennifer Connelly) quest to reach the center of an enormous otherworldly maze to rescue her infant brother Toby, whom Sarah wished away to Jareth, the Goblin King (David Bowie). With the exception of Connelly and Bowie, most of the film's significant characters are played by puppets produced by Jim Henson's Creature Shop. The film started as a collaboration between Henson and Froud, with ideas for the film first being discussed between them following a screening of their previous collaboration, The Dark Crystal. Terry Jones of Monty Python wrote the first draft of the film's script early in 1984, drawing on Froud's sketches for inspiration. Various other scriptwriters, including Laura Phillips (who had previously written several episodes of Fraggle Rock), Lucas, Dennis Lee, and Elaine May, subsequently rewrote and made additions to the screenplay, although Jones received the film's sole screenwriting credit. Labyrinth was shot on location in Upper Nyack, Piermont and Haverstraw in New York, and at Elstree Studios and West Wycombe Park in the United Kingdom. The New York Times reported that Labyrinth had a budget of $25 million. The film was a box office disappointment, grossing $12.9 million during its U.S. theatrical run. The commercial failure demoralized Henson to the extent that his son Brian remembered the time of the film's release as one of the most difficult periods of his father's career. It would be the last feature film directed by Henson before his death in 1990. Although it was met with a mixed critical response upon its initial release, Labyrinth has since gained a large cult following. A four-volume comic sequel to the film, Return to Labyrinth, was published by Tokyopop between 2006 and 2010. In 2012, Archaia Studios Press announced they were developing a graphic novel prequel to the film. In January 2016, it was announced that a reboot was in development, which was later denied by screenwriter Nicole Perlman, describing it instead as a "spin-off" in the same fictional universe. Fifteen-year-old Sarah Williams rehearses a play in the park with her dog Merlin but becomes distracted by a line she is unable to remember while being watched by a barn owl. Realizing she is late to babysit her baby brother Toby, she rushes home and is confronted by her stepmother Irene before she and her father Robert leave for dinner. Sarah has many toys that she has grown out of and realizes that Toby is in possession of her treasured teddy bear Lancelot. Frustrated by this and his constant crying, Sarah rashly wishes Toby be taken away by the Goblin King Jareth, a character in the play she is rehearsing. She is shocked when Toby disappears and the Goblin King confronts her and transports her to his kingdom. He refuses to return the baby but gives Sarah thirteen hours to solve his labyrinth and find him before Toby is turned into a goblin forever. Sarah meets a dwarfish man named Hoggle, who aids her in entering the Labyrinth. She has trouble finding turns and corners but then meets a talking worm who inadvertently sends her in the wrong direction. Sarah ends up in an oubliette, where she reunites with Hoggle. After they confront Jareth and escape one of his traps, the two encounter a large beast named Ludo. Hoggle flees in a cowardly fashion while Sarah befriends Ludo. After another riddle, she loses him in a forest. Hoggle encounters Jareth, who gives him a drugged peach and instructs him to give it to Sarah, calling his loyalty into question, as he was supposed to lead her back to the beginning of the maze. Sarah is assaulted by a group of creatures called Fireys with detachable body parts who try to remove her head, but Hoggle comes to her aid. She kisses him, and Jareth magically sends them to the Bog of Eternal Stench as punishment, where they reunite with Ludo. Sarah, Hoggle, and Ludo meet a guard of the bridge out of the swamp named Sir Didymus, an anthropomorphic fox, and his Old English Sheepdog "steed" named Ambrosius. After Ludo howls and summons a trail of rocks to save Sarah from falling into the bog, Didymus joins the group (her three new friends are just like some of the toys in her room). After the group gets hungry, Hoggle gives Sarah the peach and runs away as she falls into a trance and begins to lose her memories. She has a dream where Jareth comes to her at a masquerade ball, proclaiming his love for her, but she begins to remember and escapes, falling into a junkyard. After an old Junk Lady fails to brainwash her and her memory is jogged, she is rescued by Ludo and Didymus, and they are right outside Goblin City near Jareth's castle. They are confronted by the gate guard, but Hoggle bravely comes to their rescue. Despite his feeling unworthy of forgiveness for his betrayal, Sarah and the others welcome him back, and they enter the city together. Jareth is alerted to their presence and sends his goblin army to stop them, but Ludo howls and summons a mountain's worth of rocks to chase the guards away, and they enter the castle. Sarah insists she must face Jareth alone and promises to call the others if needed. In a room modeled after an Escher staircase drawing, she confronts Jareth while trying to retrieve Toby. She recites the lines from her play that mirror her adventure to that point, but she still cannot remember the last line. As Jareth begs her to fear him, love him and obey him, promising he will love her, and give her anything she wants, she remembers the line, "You have no power over me!" Defeated at the last second, Jareth returns Sarah and Toby home safely and turns into a barn owl, flying away. Realizing how important Toby is to her, Sarah gives him Lancelot and returns to her room. After she hears her father and stepmother come in, she sees her friends in the mirror and realizes even though she is growing up, she still needs them in her life every now and again. In an instant, a number of the major characters from the Labyrinth appear in her room for a raucous celebration, and she reunites with Hoggle, Ludo, Didymus, and Ambrosius. As they celebrate, Jareth, in his owl form, watches from outside and then flies away into the night. David Bowie as Jareth the Goblin King, the ruler of the Goblins. Toby Froud as Toby Williams, Sarah's baby brother. Christopher Malcolm as Robert, Sarah and Toby's father. Shelley Thompson as Irene, Toby's mother and Sarah's stepmother. Juggler Michael Moschen performed Jareth's elaborate crystal-ball contact juggling manipulations. Richard Corliss noted that the film appeared to have been influenced by The Wizard of Oz and the works of Maurice Sendak, writing, "Labyrinth lures a modern Dorothy Gale out of the drab Kansas of real life into a land where the wild things are." Nina Darnton wrote that the plot of Labyrinth "is very similar to Outside Over There by Mr. Sendak, in which 9-year-old Ida's baby sister is stolen by the goblins". This almost got the film into legal trouble, as the similarity caused Sendak's lawyers to advise Jim Henson to stop production on the film. However, the legal complaint was eventually settled, with an end credit being added that states, "Jim Henson acknowledges his debt to the works of Maurice Sendak." Sendak's Outside Over There and Where the Wild Things Are are shown briefly in Sarah's room at the start of the film, along with copies of Alice in Wonderland, The Wizard of Oz, and Grimms' Fairy Tales. The film's concept designer Brian Froud has stated that the character of Jareth was influenced by a diverse range of literary sources. In his afterword to The Goblins of Labyrinth, Froud wrote that Jareth references "the romantic figures of Heathcliff in Wuthering Heights and a brooding Rochester from Jane Eyre" and The Scarlet Pimpernel. Bowie's costumes were intentionally eclectic, drawing on the image of Marlon Brando's leather jacket from The Wild One as well as that of a knight "with the worms of death eating through his armour" from Grimms' Fairy Tales. In his audio commentary of Labyrinth, Froud said that Jareth also has influences from Japanese Kabuki theatre. The dialogue starting with phrase, "you remind me of the babe" that occurs between Jareth and the goblins, in the Magic Dance sequence in the film, is a direct reference to an exchange between Cary Grant and Shirley Temple in the 1947 film The Bachelor and the Bobby-Soxer. According to the film's conceptual designer Brian Froud, Labyrinth was first discussed between himself and director Jim Henson. Both agreed to work on another project together, and Froud suggested that the film should feature goblins. On the same journey, Froud "pictured a baby surrounded by goblins" and this strong visual image – along with Froud's insight that goblins traditionally steal babies – provided the basis for the film's plot. Discussing the film's origins, Henson explained that he and Froud "wanted to do a lighter weight picture, with more of a sense of comedy since Dark Crystal got kind of heavy – heavier than we had intended. Now I wanted to do a film with the characters having more personality, and interacting more." Labyrinth was being seriously discussed as early as March 1983, when Henson held a meeting with Froud and children's author Dennis Lee. Lee was tasked with writing a novella on which a script could be based, submitting it at the end of 1983. Henson approached Terry Jones to write the film's script as "his daughter Lisa had just read Erik the Viking and suggested that he try me as screen-writer." Jones was given Dennis Lee's novella to use as a basis for his script, but later told Empire that Lee had produced an unfinished "poetic novella" that he "didn't really get on with." In light of this, Jones "discarded it and sat down with Brian [Froud]'s drawings and sifted through them and found the ones that I really liked, and started creating the story from them." While Jones is credited with writing the screenplay, the shooting script was actually a collaborative effort that featured contributions from Henson, George Lucas, Laura Phillips, and Elaine May. Jones himself has said that the finished film differs greatly from his original vision. According to Jones, "I didn't feel that it was very much mine. I always felt it fell between two stories, Jim wanted it to be one thing and I wanted it to be about something else." Jones has said his version of the script was "about the world, and about people who are more interested in manipulating the world than actually baring themselves at all." 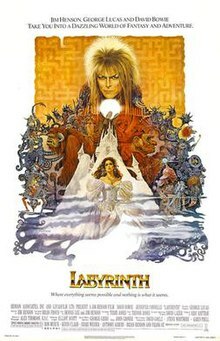 In Jones' original script, Jareth merely seems "all powerful to begin with" and is actually using the Labyrinth to "keep people from getting to his heart." Jones has said that Bowie's involvement in the project had a significant impact on the direction taken with the film. Jones had originally intended for the audience not to see the center of the Labyrinth prior to Sarah's reaching it, as he felt that doing so robbed the film of a significant 'hook.' With the thought of Bowie starring in the film in mind, Henson decided he wanted Jareth to sing and appear throughout the film, something Jones considered to be the "wrong" decision. Despite his misgivings, Jones re-wrote the script to allow for songs to be performed throughout the film. This draft of the script "went away for about a year", during which time it was re-drafted first by Laura Phillips and subsequently by George Lucas. An early draft of the script attributed to Jones and Phillips is markedly different from the finished film. The early script has Jareth enter Sarah's house in the guise of Robin Zakar, the author of a play she is due to perform in. Sarah does not wish for her brother to be taken away by the goblins, and Jareth snatches him away against her will. Jareth is overtly villainous in this draft of the script, and during his final confrontation with Sarah he tells her he would "much rather have a Queen" than "a little goblin prince." The early script ends with Sarah kicking Jareth in disgust, her blows causing him to transform into a powerless, sniveling goblin. In the extensive junkyard scene, Jareth operates the Junk Lady as a puppet, whereas in the film she is autonomous. There is actually a pub or bar in the Labyrinth where the Man with Hat and Hoggle gather, and the river Lethe in Greek myth is mentioned. As well, the ballroom scene features extensive dialogue between Jareth and Sarah, whereas in the film there is none (although there is in the novelization by A. C. H. Smith), and the goings-on with the dancers in the ballroom are more overtly sexualized. The re-drafted script was sent to Bowie, who found that it lacked humor and considered withdrawing his involvement in the project as a result. To ensure Bowie's involvement, Henson asked Jones to "do a bit more" to the script in order to make it more humorous. Elaine May met with Henson several months prior to the start of filming in April 1985, and was asked to polish the script. May's changes "humanized the characters" and pleased Henson to the extent that they were incorporated into the film's shooting script. At least twenty-five treatments and scripts were drafted for Labyrinth between 1983–85, and the film's shooting script was only ready shortly before filming began. The protagonist of the film was, at different stages of its development, going to be a King whose baby had been put under an enchantment, a princess from a fantasy world, and a young girl from Victorian England. In order to make the film more commercial, they made the lead a teenage girl from contemporary America. Henson noted that he wished to "make the idea of taking responsibility for one's life – which is one of the neat realizations a teenager experiences – a central thought of the film." Auditions for the lead role of Sarah began in England in April 1984. Helena Bonham Carter auditioned for the role, but was passed over in favor of an American actress. Monthly auditions were held in the U.S. until January 1985, and Jane Krakowski, Yasmine Bleeth, Sarah Jessica Parker, Marisa Tomei, Laura Dern, Ally Sheedy, Maddie Corman, and Mia Sara all auditioned for the role. Of these, Krakowski, Sheedy and Corman were considered to be the top candidates. 14-year-old actress Jennifer Connelly "won Jim [Henson] over" and he cast her within a week. According to Henson, Connelly was chosen as she "could act that kind of dawn-twilight time between childhood and womanhood." Connelly moved to England in February 1985 in advance of the film's rehearsals, which began in March. Discussing her understanding of her role with Elle, Connelly said that the film is about "a young girl growing out of her childhood, who is just now becoming aware of the responsibilities that come with growing up." The character of Jareth also underwent some significant developments during the early stages of pre-production. According to Henson he was originally meant to be another puppet creature in the same vein as his goblin subjects. Henson eventually wanted a big, charismatic star to play the Goblin King, and pursued a musician for the role, considering Sting, Prince, Mick Jagger, and Michael Jackson before choosing Bowie. "I wanted to put two characters of flesh and bone in the middle of all these artificial creatures," Henson explained, "and David Bowie embodies a certain maturity, with his sexuality, his disturbing aspect, all sorts of things that characterize the adult world". Henson met David Bowie in the summer of 1983 to seek his involvement, as Bowie was in the U.S. for his Serious Moonlight Tour at the time. Henson continued to pursue Bowie for the role of Jareth, and sent him each revised draft of the film's script for his comments. During a meeting that took place on June 18, 1984, Henson showed Bowie The Dark Crystal and a selection of Brian Froud's concept drawings to pique his interest in the project. Bowie formally agreed to take part on February 15, 1985, several months before filming began. Discussing why he chose to be involved in the film, Bowie explained, "I'd always wanted to be involved in the music-writing aspect of a movie that would appeal to children of all ages, as well as everyone else, and I must say that Jim gave me a completely free hand with it. The script itself was terribly amusing without being vicious or spiteful or bloody, and it had a lot more heart in it than many other special effects movies. So I was pretty hooked from the beginning." Principal photography began on April 15, 1985, at Elstree Studios. The team that worked on Labyrinth was largely assembled from talent who had been involved in various other projects with the Jim Henson Company. Veteran performers Frank Oz and Dave Goelz operated various puppets in the film, as did Karen Prell, Ron Mueck and Rob Mills who had all worked with Henson on Fraggle Rock. Kevin Clash, a crew member on Sesame Street best known for voicing the character Elmo, worked on the film. Members of Henson's family also worked on the production, including son Brian and daughter Cheryl. Newcomers working on the production included puppeteer Anthony Asbury, who had previously worked on the satirical puppet show Spitting Image. Labyrinth took five months to film, and was a complicated shoot due to the myriad of puppets and animatronic creatures involved. In the making-of documentary Inside the Labyrinth, Henson stated that although Jim Henson's Creature Shop had been building the puppets and characters required for around a year and a half prior to shooting, "everything came together in the last couple weeks." Henson noted, "even if you have the characters together, the puppeteers start working with them, they find problems or they try to figure out what they're going to do with these characters." Although each of the film's key puppets required a small team of puppeteers to operate it, the most complex puppet of the production was Hoggle. Shari Weiser was inside the costume, while Hoggle's face was radio-controlled by Brian Henson and three other operators. Speaking in the Inside the Labyrinth documentary, Brian Henson explained that Weiser "does all the body movement and her head is inside the head. However, the jaw is not connected to her jaw. Nothing that the face is doing has any connection with what she's doing with her face. The other four members of the crew are all radio crew, myself included." Speaking of the challenges involved with performing Hoggle, Brian Henson said, "five performers trying to get one character out of one puppet was a very tough thing. Basically what it takes is a lot of rehearsing and getting to know each other." At the early stages of filming, stars Connelly and Bowie found it difficult to interact naturally with the puppets they shared most of their scenes with. Bowie told Movieline "I had some initial problems working with Hoggle and the rest because, for one thing, what they say doesn't come from their mouths, but from the side of the set, or from behind you." Connelly remarked, "it was a bit strange [working almost exclusively with puppets in the film], but I think both Dave [Bowie] and I got over that and just took it as a challenge to work with these puppets. And by the end of the film, it wasn't a challenge anymore. They were there, and they were their characters." The film required large and ambitious sets to be constructed, from the Shaft of Hands to the rambling, distorted Goblin City where the film's climactic battle takes place. The Shaft of Hands sequence was filmed on a rig that was roughly forty feet high, and required nearly a hundred performers to operate the grey, scaly hands integral to the scene. Connelly was strapped into a harness when shooting the scene, and would spend time between takes suspended midway up the shaft. The set of the Goblin City was built on Stage 6 at Elstree Studios near London, and required the largest panoramic back-cloth ever made. According to Production Designer Elliot Scott, the biggest challenge he faced was building the forest Sarah and her party pass through on their way to Jareth's Castle. The film's production notes state, "the entire forest required 120 truckloads of tree branches, 1,200 turfs of grass, 850 pounds of dried leaves, 133 bags of lichen, and 35 bundles of mossy old man's beard." While most filming was conducted at Elstree Studios, a small amount of location shooting was carried out in England and the U.S. The park seen at the start of the film is West Wycombe Park in Buckinghamshire, England. The scenes of Sarah running back home were filmed in various towns in New York, namely Upper Nyack, Piermont and Haverstraw. Shooting wrapped on September 8, 1985. Most of the visual effects on Labyrinth were achieved in-camera, with several notable exceptions. The most prominent of these post-production effects was the computer-generated owl that appears at the opening of the film. The sequence was created by animators Larry Yaeger and Bill Kroyer, and marked the first use of a realistic CGI animal in a film. The owl head maquette had to be rescued from a skip when Omnibus, the animation company, went bankrupt in 1987. The scene where Sarah encounters the Fire Gang had to be altered in post-production as it had been filmed against black velvet cloth, to disguise the puppeteers, and a new forest background was added behind. Jim Henson was unhappy with the compositing of the finished scene, although he considered the puppetry featured in it worthy of inclusion. Henson received help editing the film from executive producer George Lucas. According to Henson, "When we hit the editing, I did the first cut, and then George was heavily involved on bringing it to the final cut. After that, I took it over again and did the next few months of post-production and audio." Henson went on to explain, "When you edit a film with somebody else you have to compromise. I always want to go one way, and George goes another way, but we each took turns trading off, giving and taking. George tends to be very action-oriented and he cuts dialogue quite tight; I tend to cut looser, and go for more lyrical pauses, which can slow the story. So, I loosen up his tightness, and he tightens my looseness." The soundtrack album features Trevor Jones' score, which is split into six tracks for the soundtrack: "Into the Labyrinth", "Sarah", "Hallucination", "The Goblin Battle", "Thirteen O'Clock" and "Home at Last". Bowie recorded five songs for the film: "Underground", "Magic Dance", "Chilly Down", "As the World Falls Down" and "Within You". "Underground" features on the soundtrack twice, first in an edited version that was played over the film's opening sequence and secondly in full. "Underground" was released in various territories as a single, and in certain markets was also released in an instrumental version and an extended dance mix. "Magic Dance" was released as a 12" single in the U.S. "As the World Falls Down" was initially slated for release as a follow-up single to "Underground" at Christmas in 1986, but this plan did not materialize. The only song Bowie did not perform lead vocal on is "Chilly Down", which was performed by Charles Augins, Richard Bodkin, Kevin Clash, and Danny John-Jules, the actors who voiced the 'Firey' creatures in the film. Steve Barron produced promotional music videos for "Underground" and "As the World Falls Down". The music video for "Underground" features Bowie as a nightclub singer who stumbles upon the world of the Labyrinth, encountering many of the creatures seen in the film. The clip for "As the World Falls Down" integrates clips from the film, using them alongside black-and-white shots of Bowie performing the song in an elegant room. In 2017, Capitol Studios announced that it will be reissuing the soundtrack on a Vinyl disc, this will include all five originals songs of David Bowie along with Trevor Jones's score. The production of Labyrinth was covered in multiple high-profile magazines and newspapers, in anticipation of its release, with articles appearing in The New York Times, Time and Starlog magazine. An article that appeared in The New York Times shortly after filming wrapped in September 1985 focused heavily on the film's large scale, emphasizing the size of the production and selling Labyrinth as a more "accessible" film than The Dark Crystal due to the casting of live actors in its key roles. An hour-long making-of documentary that covered the filming of Labyrinth and included interviews with the key figures involved in its production was broadcast on television as Inside the Labyrinth. Labyrinth was featured in music trade papers such as Billboard due to David Bowie's soundtrack for the film. Bowie was not heavily involved in promoting the film, but Jim Henson was nonetheless grateful that he produced a music video to accompany the song "Underground" from the soundtrack, saying, "I think it's the best thing he could have done for the film." Ted Coconis produced a one-sheet poster for the film's North American release. A range of merchandise was produced to accompany the film's release, including plush toys of Sir Didymus and Ludo, a board game, computer game and multiple jigsaw puzzles. An exhibition of the film's characters and sets toured across shopping malls in various cities in the U.S, including New York City, Dallas and Chicago. Labyrinth was featured in an exhibition titled 'Jim Henson's Magic World' that was shown at the Seibu Department Store in Tokyo in August 1986. Labyrinth opened in America/Germany theaters on June 27, 1986. The film received a royal premiere on December 1, 1986 in London, with Charles, Prince of Wales and Diana, Princess of Wales in attendance. Jim Henson, Brian Henson, Brian Froud, Jennifer Connelly, and the animatronic creature Ludo were all present to support the film. The royal premiere brought the film a significant level of media coverage in the United Kingdom and an article that appeared in The Sun quoted the Princess of Wales as remarking, "Isn't he wonderful!" upon being introduced to Ludo. The film was rolled out in other European countries largely between December 1986 and February 1987, and premiered in France as Labyrinthe on December 2 and in West Germany as Die Reise ins Labyrinth (The Journey into the Labyrinth) on December 13. The film was released in Denmark as Labyrinten til troldkongens slot (The Labyrinth to the Troll King's Castle) on February 20, 1987, and saw its last theatrical release in Hungary under the title Fantasztikus labirintus (Fantastic Labyrinth) when it premiered there on July 7, 1988. The movie was released in Brazil on December 25, 1986 where it was named "Labirinto – A Magia do Tempo" (Labyrinth – The Magic of Time). In 2012, the film was digitally remastered and re-released at The Astor Theatre in Melbourne, Australia. Labyrinth was first released on VHS, Betamax, and pan and scan LaserDisc in 1987 by Embassy Home Entertainment in the US and by Channel 5 Video Distribution in the UK. New Line Home Video re-released the film on LaserDisc in Widescreen through Image Entertainment in 1994. Sony Pictures Home Entertainment re-issued the film on VHS for the last time in 1999 in the US under the name of its subsidiary company, Columbia-TriStar and in the UK the same year, with Inside the Labyrinth included as a special feature. The film made its DVD premiere in 1999 in the US, and has since been re-released on DVD in 2003 and 2007. All DVD releases of the film feature the Inside the Labyrinth documentary as an extra. The 2003 re-release was described as a collector's edition, and featured a set of exclusive collectors cards that featured concept art by Brian Froud. The 2007 release was promoted an Anniversary Edition, and featured a commentary by Brian Froud and two newly produced making-of documentaries: "Journey Through the Labyrinth: Kingdom of Characters" and "Journey Through the Labyrinth: The Quest for Goblin City" which featured interviews with producer George Lucas, choreographer Gates McFadden of Star Trek fame (listed as Cheryl McFadden) and Brian Henson. The film was released on Blu-ray in 2009, in a package that replicated the extras featured on the 2007 Anniversary Edition DVD. The Blu-ray release featured one new special feature, a picture-in-picture track that lasts the length of the film and features interviews with the crew and several minor cast members including Warwick Davis. A 30th Anniversary edition of Labyrinth was released on DVD, Blu-ray, and 4K Blu-ray on September 20, 2016. There also will be an Amazon exclusive version with packaging similar to Jareth's Escher-style stairs. New features include "The Henson Legacy" featuring Jennifer Connelly and members of the Henson family discussing Jim Henson's puppetry style and includes a visit to The Center of Puppetry Arts, which houses many of Jim Henson's puppets. Adam Savage from Mythbusters hosts a Q&A with Brian Henson, David Goelz, Karen Prell, and Sheri Weiser. Jennifer Connelly, Brian Henson, and Cheryl Henson pay tribute to David Bowie in "The Goblin King". Labyrinth opened at number eight in the U.S. box office charts with $3,549,243 from 1,141 theaters, which placed it behind The Karate Kid Part II, Back to School, Legal Eagles, Ruthless People, Running Scared, Top Gun, and Ferris Bueller's Day Off. In its next weekend at the box office, the film dropped to number 13 in the charts, only earning $1,836,177. By the end of its run in U.S cinemas the film had grossed $12,729,917, just over half of its $25 million budget. "As he did with less success in The Dark Crystal, Mr. Henson uses the art of puppetry to create visual effects that until very recently were possible to attain only with animation. The result is really quite startling. It removes storyboard creations from the flat celluloid cartoon image and makes them three-dimensional, so that they actually come alive and interact with living people. The technique makes animation seem dull and old-fashioned by comparison." — Nina Darnton of The New York Times on Labyrinth's technical achievements. The film received mixed to positive reviews from critics. On Rotten Tomatoes, the film averages a 68% positive rating; the general consensus states: "While it's arguably more interesting on a visual level, Labyrinth provides further proof of director Jim Henson's boundless imagination." On Metacritic, which uses a "weighted average" of all the critics' scores, Labyrinth scores 50 out of 100 meaning “mixed or average reviews”. While acknowledging that Labyrinth was made with "infinite care and pains", Roger Ebert gave the film two stars out of four as he felt that the film "never really comes alive". Ebert said that as the film was set in an "arbitrary world" none of the events in it had any consequences, robbing the film of any dramatic tension. Gene Siskel's review of Labyrinth for the Chicago Tribune was highly negative, and he referred to it as an "awful" film with a "pathetic story", "much too complicated plot" and a "visually ugly style". Siskel objected to the film's "violent" plot, writing, "the sight of a baby in peril is one of sleaziest gimmicks a film can employ to gain our attention, but Henson does it." Other critics were more positive. Kathryn Buxton found that it had "excitement and thrills enough for audiences of all ages as well as a fun and sometimes slightly naughty sense of humor". Bruce Bailey admired the film's script, stating, "Terry Jones has drawn on his dry wit and bizarre imagination and come up with a script that transforms these essentially familiar elements and plot structures into something that fairly throbs with new life." Bailey was also impressed by the film's depth, writing, "adults will have the additional advantage of appreciating the story as a coming-of-age parable." Several critics noted the film's subtext, and found it successful to varying degrees. Saw Tek Meng acknowledged, "Sarah's experiences in the labyrinth are symbolic of her transition from child to woman" but ultimately found the film "too linear" for its latent themes to come through. Nina Darnton compared the film's tone to the writings of E.T.A. Hoffman, stating that Hoffman's The Nutcracker "is also about the voyage to womanhood, including the hint of sexual awakening, which Sarah experiences too in the presence of a goblin king." Darton enjoyed the film and considered it to be more successful than Henson's previous collaboration with Brian Froud, The Dark Crystal. Connelly's portrayal of Sarah polarized critics and received strong criticism from some reviewers. Critic Kirk Honeycutt referred to Connelly as "a bland and minimally talented young actress" Writing for The Miami News, Jon Marlowe stated, "Connelly is simply the wrong person for the right job. She has a squeaky voice that begins to grate on you; when she cries, you can see the onions in her eyes." Contrary to these negative views, an anonymous review in St. Petersburg Times praised her acting saying, "Connelly makes the entire experience seem real. She acts so naturally around the puppets that you begin to believe in their life-like qualities." Bowie's performance was variously lauded and derided. In his largely positive review of the film, Corliss praised him as "charismatic" referring to his character as a "Kabuki sorcerer who offers his ravishing young antagonist the gilded perks of adult servitude". Bruce Bailey enjoyed Bowie's performance, writing, "the casting of Bowie can't be faulted on any count. He has just the right look for a creature who's the object of both loathing and secret desire." In a largely critical review, the St. Petersburg Times found, "Bowie forgoes acting, preferring to prance around his lair while staring solemnly into the camera. He's not exactly wooden. Plastic might be a more accurate description." The film's mixed reviews and poor box office takings demoralized Henson to the extent that his son Brian remembered the time of the film's release as being "the closest I've seen him to turning in on himself and getting quite depressed". It was the last feature film directed by Henson before his death in 1990. Since Henson's death, Labyrinth has been re-evaluated by several notable critics. A review from 2000 in Empire magazine called the film "a fabulous fantasy" and wrote, "David Bowie cuts a spooky enough figure in that fright wig to fit right in with this extraordinary menagerie of Goth Muppets. And Jennifer Connelly, still in the flush of youth, makes for an appealingly together kind of heroine." Writing for the Chicago Tribune in 2007, Michael Wilmington described Labyrinth as "dazzling", writing that it is "a real masterpiece of puppetry and special effects, an absolutely gorgeous children's fantasy movie". In 2010 Total Film ran a feature called 'Why We Love Labyrinth' which described Labyrinth as a "hyper-real, vibrant daydream, Labyrinth's main strength lies in its fairytale roots, which give the fantastical story a platform from which to launch into some deliriously outlandish scenarios". In their February 2012 issue, Empire featured a four-page spread on Labyrinth as part of their Muppet Special. Cosplay at Fan Expo Canada 2016 in Toronto. Despite its poor performance at the American box office, Labyrinth was a success on home video and later on DVD. David Bowie told an interviewer in 1992, "every Christmas a new flock of children comes up to me and says, 'Oh! you're the one who's in Labyrinth!'" In 1997, Jennifer Connelly said "I still get recognized for Labyrinth by little girls in the weirdest places. I can't believe they still recognize me from that movie. It's on TV all the time and I guess I pretty much look the same." Labyrinth has become a cult film. Brian Henson remembered his father Jim Henson as being aware that Labyrinth and The Dark Crystal both had cult followings by the time of his death in 1990, saying, "he was able to see all that and know that it was appreciated." Academic Andrea Wright wrote that Labyrinth has managed to maintain audience popularity long after its initial release to a greater extent than The Dark Crystal. Since 1997, an annual two-day masquerade ball called the "Labyrinth of Jareth" where revelers come dressed in costumes inspired by the film has been held in Hollywood. Labyrinth has a significant Internet fan following, and as of September 1, 2015, Fanfiction.net hosts over 8,900 stories in its Labyrinth section. The strong DVD sales of Labyrinth prompted rights-holders the Jim Henson Company and Sony Pictures to look into making a sequel, and Curse of the Goblin King was briefly used as a place-holder title. However, the decision was ultimately taken to avoid making a direct sequel, and instead produce a fantasy film with a similar atmosphere. Fantasy author Neil Gaiman and artist Dave McKean were called in to write and direct a film similar in spirit to Labyrinth, and MirrorMask was ultimately released in selected theaters in 2005 after premiering at the Sundance Film Festival. On January 22, 2016, Sony Pictures announced that a reboot is in development with Lisa Henson as producer and Nicole Perlman attached as the screenwriter. However, on January 25, Perlman confirmed on Twitter that while she is working on a Labyrinth project with the Jim Henson Company, it is not a remake or reboot. Perlman also discussed the timing of the rumors in conjunction with David Bowie's death and said, "Henson Co & I started talking in late 2014, so the timing of these rumors is so upsetting. I would never seek to profit from Bowie's death." Although fandom has produced its own fan fiction sequels, some fans of the original film voiced opposition to a remake or sequel. Labyrinth is ranked 72nd on Empire's “The 80 best ‘80s movies’. Since initial release, Labyrinth has been translated to other forms of media. The film was novelized by A. C. H. Smith as Labyrinth: A Novel Based On The Jim Henson Film, which is currently out of print. Along with The Dark Crystal, Archaia Publishing reprinted Labyrinth with illustrations in 2014. A three-issue comic book adaptation, which was first released in a single volume as Marvel Super Special #40, was published by Marvel Comics. Tokyopop, in partnership with The Jim Henson Company, published a manga-style four-volume comic called Return to Labyrinth, written by Jake T. Forbes and illustrated by Chris Lie, with cover art by Kouyu Shurei. Return to Labyrinth follows the adventures of Toby as a teenager, when he is tricked into returning to the Labyrinth by Jareth. Artertainment, in collaboration with The Jim Henson Company, is developing a prequel comic book about the story of how Jareth became the Goblin King. Project editor Stephen Christy has stated the graphic novel will be a "tragic story". While it is still in the early stages of development, there are plans for the novel to integrate music into the plot in some way. Prior to his death in early 2016, David Bowie was approached by Archaia Comics in order to seek permission to use his likeness, and ascertain if he wished to have any involvement in the project. Brian Froud is serving as a creative consultant on the project. Froud will be producing covers for the series, as well as character designs. Archaia released a Labyrinth short story titled Hoggle and the Worm for Free Comic Book Day on May 5, 2012 and another titled Sir Didymus' Grand Day on May 4, 2013. The film was also adapted for the Commodore 64 and Apple II home computers in 1986 as Labyrinth: The Computer Game. Different versions were also released in Japan the following year for the Family Computer console and MSX computer, under the title Labyrinth: Maō no Meikyū. In January 2016, Nicole Perlman announced that she is writing the script for the sequel film. By April 2017, Fede Álvarez was confirmed to direct, as well as co-write the script with Jay Basu. Henson's daughter Lisa Henson, and Bowie's son Duncan Jones will serve as co-producers. On October 25, 2018, Álvarez confirmed that the script was complete. ^ "Labyrinth (PG)". British Board of Film Classification. June 24, 1986. Retrieved October 10, 2014. ^ "Labyrinth (1986)". Retrieved June 12, 2018. ^ a b McNary, Dave (January 22, 2016). "Sony Rebooting Jim Henson's 'Labyrinth'". Variety. Retrieved January 22, 2016. ^ Tan, Monica (January 25, 2016). "'No one is remaking Labyrinth' – screenwriter denies reports of reboot". The Guardian. Retrieved January 25, 2016. ^ "Michael Moschen Official Biography". MichaelMoschen.com. Retrieved January 25, 2012. ^ a b Corliss, Richard (July 7, 1986). "Cinema: Walt's Precocious Progeny". Time. ^ a b c Darnton, Nina (June 27, 1986). "Screen: Jim Henson's 'Labyrinth'". The New York Times. Retrieved January 21, 2012. ^ Jones, Brian Jay (September 24, 2013). Jim Henson: The Biography. Random House. ISBN 9780345526137. ^ a b Froud, Brian; Jones, Terry (2006). The Goblins of Labyrinth. New York: Abrams Books. pp. 139–153. ISBN 1419705687. ^ Brian Froud (2007). Audio Commentary by Conceptual Designer Brian Froud (DVD special feature). Sony Pictures Home Entertainment. ^ Taylor, Dawn (May 7, 2009). "Scenes We Love: The Bachelor and the Bobby-Soxer". moviefone. Retrieved March 3, 2012. ^ a b c d e f g h Pirani, Adam (August 1986). "Part Two: Into the Labyrinth with Jim Henson". Starlog. 10 (109): 44–48. ^ Henson, Jim (March 28, 2011). "3/28/1983 – 'Dennis Lee – Brian F. and I begin talking about Labyrinth in London'". Jim Henson's Red Book. Archived from the original on August 19, 2012. Retrieved January 20, 2012. ^ Henson, Jim (December 1983). "12/-/1983 – 'End of December – Dennis Lee hands in "Novella" of Labyrinth'". Jim Henson's Red Book. Retrieved January 20, 2012. ^ a b c Williams, Owen (2012). "Dance Magic Dance: 25 Years Of Labyrinth". Empire (272): 100–103. ^ "LABYRINTH: by Laura Phillips and Terry Jones". Astrolog.org. Archived from the original on January 26, 2012. Retrieved January 26, 2012. ^ a b c d Henson, Jim (January 29, 1985). "1/29/1985 – 'Jennifer Connelly auditions for Labry. Cast within a week.'". Jim Henson's Red Book. Archived from the original on March 8, 2012. Retrieved January 21, 2012. ^ Henson, Jim (February 26, 2011). "1/29/1985 – 2/26/1985 – 'Meet Elaine May on Labyr.'". Jim Henson's Red Book. Archived from the original on August 19, 2012. Retrieved January 21, 2012. ^ a b "Labyrinth Production Notes". Astrolog.org. Retrieved January 20, 2012. ^ Sauter, Michael (June 1986). "Playing Hooky". Elle. Archived from the original on July 30, 2012. Retrieved January 28, 2012. ^ a b c d Des Saunders (director), Jim Henson (writer) (1986). Inside the Labyrinth (Televised Documentary). Los Angeles: Jim Henson Television. ^ a b Schlockoff, Alain (February 1987). "Jim Henson Interview". Ecran Fantastique. ^ a b Henson, Jim (February 15, 1985). "3/28/1983 – 2/15/1985 – 'Bowie's deal is set". Jim Henson's Red Book. Henson.com. Archived from the original on August 19, 2012. Retrieved January 20, 2012. ^ a b Anonymous (June 12, 1986). "Bowie talks... about his newest film, Labyrinth". Movieline: 14. Retrieved January 20, 2012. ^ Henson, Jim (May 5, 1985). "5/5/1985 – 'To Amsterdam – (Filming Labyrinth) – Forest – Wild Things, Shaft of Hands.'". Jim Henson's Red Book. Retrieved January 13, 2012. ^ Dickholtz, Daniel (1986). "Jennifer Connelly – I Love to Do Daring Things!". Teen Idols Mania!. Archived from the original on August 6, 2012. Retrieved January 26, 2012. ^ Miller, Jon (August 2, 2011). "Lights, Camera, Action in Nyack, Piermont and Rockland". Nyack News and Views. Archived from the original on January 28, 2012. Retrieved January 28, 2012. ^ Henson, Jim (December 1, 1985) [stored December 1, 2010]. "12/1/1985 – 'Back to UK – re-shoot Hoggle'". Jim Henson's Red Book. Archived from the original on August 19, 2012. Retrieved January 13, 2012. ^ Yaeger, Larry. "A Brief, Early History of Computer Graphics in Film". Indiana University. Archived from the original on July 17, 2012. Retrieved January 20, 2012. ^ Wolff, Robert S; Yaeger, Larry (1993). "Visualization of natural phenomena". TELOS: The electronic library of science. 1: 186. ^ Vreeswijk, Simon. "A History of CGI in Movies". Stikky Media. Archived from the original on March 21, 2012. Retrieved January 21, 2012. ^ SIGGRAPH, IEEE Computer Society. Technical Committee—Computer Graphics (July 27–31, 1987). "ACM SIGGRAPH 87: Course Notes, 14th Annual Conference on Computer Graphics and Interactive Techniques". 3. The University of California: 70–71. ^ Sito, Tom (2013). Moving Innovation: A History of Computer Animation. Cambridge, MA: MIT Press. p. 194. ^ McDonald, Steve. "Labyrinth (1986)". Allmusic.com. Retrieved January 25, 2012. ^ "Labyrinth soundtrack featuring original David Bowie songs will get vinyl reissue". Metro. April 28, 2017. Retrieved September 25, 2017. ^ a b c Hartmetz, Aljean (September 15, 1985). "'Star Wars' and Muppet Wizards Team up in 'Labyrinth'". The New York Times. Archived from the original on February 3, 2012. Retrieved February 3, 2012. ^ Murphy, Jamie (September 25, 1985). "People: Sep. 23, 1985". Time. Archived from the original on February 3, 2012. Retrieved February 3, 2012. ^ "Jim Henson Time Line". Jim Henson Legacy. The Jim Henson Legacy, Inc. Archived from the original on February 4, 2012. Retrieved February 4, 2012. ^ McGowan, Chris (June 21, 1986). "Soundtrack Fastlane Already Facing Congestion As Labels Strengthen Crossover Links In Marketing Chain". Billboard. 99 (25). Retrieved February 4, 2012. ^ "Untitled Article". Sunday Star News. June 26, 1986. Accessed February 4, 2012. ^ "Labyrinth / one sheet / USA". Film On Paper. Archived from the original on July 14, 2012. Retrieved July 14, 2012. ^ a b Wright, Andrea (2005). "Selling the Fantastic". Journal of British Cinema and Television. 2 (2). Accessed 15 September 2010. ^ Henson, Jim (December 1, 2011). "12/1/1986 – 'Royal Premier Labyrinth – UK – Party at Elephant on River – then to Amsterdam, Madrid, Paris, Copenhagen'". Jim Henson's Red Book. Archived from the original on February 3, 2012. Retrieved February 3, 2012. ^ "Beauty meets a right Beast!". The Sun. December 2, 1986. Archived from the original on February 3, 2012. Retrieved February 3, 2012. ^ Saturday, Jill Harness •; 31, March; 0, 2012 at 3:28 AM •. "Watch Princess Diana Meet Ludo From The Labyrinth". Neatorama. Retrieved April 15, 2016. ^ "Release Dates For Labyrinth". imdb. amazon.com. Archived from the original on February 3, 2012. Retrieved February 3, 2012. ^ Henderson, Eric (February 3, 2004). "Labyrinth: Collector's Edition Box Set". Slant Magazine. Retrieved January 25, 2012. ^ Jacobson, Colin (August 29, 2007). "Labyrinth: Anniversary Edition (1986)". DVD Movie Guide. Archived from the original on January 28, 2012. Retrieved January 28, 2012. ^ Tyner, Adam (September 29, 2009). "Labyrinth (Blu-ray)". DVDTalk.com. Archived from the original on January 28, 2012. Retrieved January 28, 2012. ^ "Labyrinth 30th Anniversary Edition 4K Blu-ray". Blu-ray.com. Retrieved November 25, 2016. ^ "Weekend Box Office – June 27–29, 1986". Box Office Mojo. Retrieved January 25, 2012. ^ "Weekend Box Office – July 4–6, 1986". Box Office Mojo. Retrieved January 25, 2012. ^ "Labyrinth". Box Office Mojo. Retrieved January 25, 2012. ^ Benson, Shelia (June 26, 1986). "Movie Review : Going To Great Lengths In A Trying 'Labyrinth'". The Los Angeles Times. Archived from the original on January 28, 2012. Retrieved January 28, 2012. ^ "Labyrinth (1986)". Rotten Tomatoes. Retrieved January 25, 2012. ^ "Labyrinth". Metacritic.com. Archived from the original on January 25, 2012. Retrieved January 25, 2012. ^ Ebert, Roger (June 27, 1986). "Labyrinth". Rogerebert.com. Retrieved October 21, 2010. ^ Siskel, Gene (June 30, 1986). "Jim Henson`s Wizardry Lost In `Labyrinth`". Chicago Tribune. Retrieved January 28, 2012. ^ Buxton, Kathryn (July 2, 1986). "Henson's fantasy Labyrinth takes cues from the classic". The Palm Beach Post. ^ a b Bailey, Bruce (July 3, 1986). "Labyrinth is a Fairy-Tale Movie That Grown-Ups Can Believe In". The Montreal Gazette. ^ Meng, Saw Tek (June 27, 1986). "Yellow Brick Road Revisited". New Strait Times. ^ Honeycutt, Kirk (June 27, 1986). "Quality gets lost in Labyrinth". The Spokesman. ^ Marlowe, Jon (June 27, 1986). "Bowie's trapped in Labyrinth". The Miami News. ^ a b Anonymous (June 27, 1986). "Labyrinth Review". St. Petersburg Times. ^ Harrigan, Stephen (July 1990). "It's Not Easy Being Blue". Life. Retrieved May 6, 2007. ^ Nathan, Ian (2000). "Labyrinth: Review". Empire. ^ Wilmington, Michael (June 15, 2007). "'Labyrinth' movie review: 3 stars". Chicago Tribune. Retrieved January 28, 2012. ^ Winning, Josh (May 13, 2010). "Why We Love... Labyrinth". Total Film. ^ a b c Weiland, Jonah (August 6, 2004). "Putting on the "Mirrormask": Executive Producer Michael Polis on the film". Examiner. Retrieved January 25, 2012. ^ Campbell, Virginia (1992). "Bowie at the Bijou". Moveline. 3 (7). ^ Spelling, Ian (1997). "Damsel in the Dark". Starlog (242). ^ Sparrow, A.E. (September 11, 2006). "Return to Labyrinth Vol. 1 Review". IGN. Retrieved July 10, 2007. ^ Hartlaub, Peter (June 25, 2007). "Staying power is true magic of Henson's 'Dark Crystal'". San Francisco Chronicle. Archived from the original on February 4, 2012. Retrieved February 4, 2012. ^ Ohanesian, Liz (May 20, 2010). "Shawn Strider: Labyrinth of Jareth". LA Weekly Magazine. ^ Painter, Alysia Gray (July 15, 2010). ""Labyrinth" Masquerade Attracts Merry Fairies". NBC Los Angeles. ^ "Movies". Fanfiction.net. Retrieved January 25, 2012. ^ Cameron, Jen (October 26, 2005). "Movie Review: Mirrormask". Stylus Magazine. Retrieved January 28, 2012. ^ Jones, Nate (January 25, 2016). "Screenwriter Denies Reports of Labyrinth Remake, Calls Timing 'Awful'". Vulture. New York. Retrieved January 25, 2016. ^ "'Labyrinth' Reboot Rumors Emerge In Wake Of David Bowie's Death". The Movie Network. Retrieved April 15, 2016. ^ "The Labyrinth Within the Labyrinth". www.marysia.com. Retrieved April 15, 2016. ^ "The Labyrinth Fandom: A History (Part One, 1983–1993)". Labyrinth Nook. Retrieved April 15, 2016. ^ "Labyrinth Fanfiction Archive". www.oocities.org. Retrieved April 15, 2016. ^ "'Labyrinth' Remake/ Sequel Rumors Met With Fan Opposition". The Movie Network. Retrieved April 15, 2016. ^ "The 80 best '80s Movies'". Empire. Retrieved January 29, 2018. ^ "GCD :: Series :: Labyrinth". comics.org. ^ Forbes, Jake T.; Lie, Chris (August 8, 2006). Return to Labyrinth. San Francisco, California: TokyoPop. ISBN 978-1-59816-725-2. ^ Schneider, Karl (May 18, 2006). "Exclusive First Look at RETURN TO LABYRINTH Manga Cover". Mania.com. Archived from the original on July 27, 2014. Retrieved January 26, 2012. ^ Flood, Alison (January 9, 2012). "Labyrinth gets graphic novel prequel". The Guardian. London. Retrieved January 25, 2012. ^ a b Gartler, James (January 6, 2012). "'Labyrinth' graphic novel prequel to answer, 'Who was the Goblin King?' – EXCLUSIVE". Entertainment Weekly. Retrieved January 25, 2012. ^ Connelly, Brendon. "For David Bowie's Birthday: A Preview Of Archaia's Next Labyrinth Comic, And Talk Of Another". Bleeding Cool. Retrieved January 25, 2012. ^ "The Labyrinth Resource". The Labyrinth Resource. ^ "Labyrinth: Maou no Meikyuu". Game FAQs. Retrieved January 25, 2012. ^ Handler, Rachel (January 23, 2016). "David Bowie's Labyrinth Is Getting A Sequel". Vanity Fair. Retrieved January 25, 2016. ^ Knoll, Justin (April 13, 2017). "'Don't Breathe' Helmer Fede Alvarez to Direct 'Labyrinth' Spin-Off for TriStar". Variety. Retrieved April 13, 2017. ^ Davis, Erik (October 25, 2018). "Director Fede Alvarez Says The 'Labyrinth' Sequel Has a Script and is Moving Forward". Fandango Media. Retrieved October 26, 2018. Froud, Brian; Jones, Terry (2006). Goblins of the Labyrinth. New York: Abrams. ISBN 978-0-8109-7055-7. Howard, Kim (1993). Life Before And After Monty Python. New York: Plexus. ISBN 0-312-08695-4. Pegg, Nicholas (2002). The Complete David Bowie. London: Reynolds & Hearn Ltd. ISBN 1-903111-40-4. Smith, A. C. H. (1986). Labyrinth: A Novel Based On The Jim Henson Film. New York: Henry Holt. ISBN 978-0-03-007322-9. This page was last edited on 22 April 2019, at 09:10 (UTC).